Here we have an unusual frozen treat. The ingredients aren't what I'd usually think of when I hear the words "ice cream", but actually, that's just what they turn out to be. And the best part? You don't even need to dig out the ice cream maker for this one. Maybe it should've been called Banana Easy Cream! I had some bananas and wanted to try something new with them (man cannot live on banana bread alone). The search began and, hey presto! I came across an easy to make treat that's a snap to make. 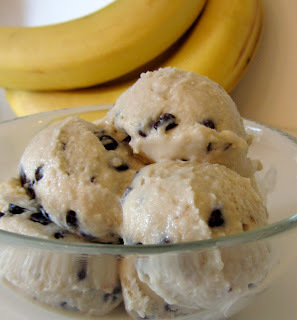 I found this ice cream, from Bon Appetit, on epicurious. Quite a few people were leaving comments about the sweetness - or overabundance thereof. I have two suggestions to overcome this: use bananas that are ripe, but not as ripe as you might use for a bread. And, add semi-sweet chocolate to the mix. I did this in the form of mini chips, but I think ribbons of fudge or peanut butter would be wonderful, too. I found the finished ice cream to be just right - not at all too sweet. The work and effort required for this recipe are minimal. The only real time spent here is in the freezer. And what you end up with is a creamy, dreamy, yummy treat with a banana punch. So, next time you have some extra bananas on hand, this is a great recipe to use them in! 1. Stir the banana together with the sc milk and vanilla. Place in the freezer while you work on the whipped cream. 2. Whisk the cream in a clean bowl to stiff peaks (the bowl of a stand mixer works well). 3. Fold 1/3 of the banana mixture into the cream. Fold in another 1/3. Fold in the last third of banana mixture. 4. Cover and freeze until soft set, stirring occasionally (about 2 hours). 5. Beat the mixture until fluffy. Stir in the chocolate chips. Pour the mixture into freezer-safe container. Cover and freeze until firm (4-6 hours).